Australia's only dedicated sustainable house design magazine, profiling the best in environmentally aware architectural and design solutions. The nation's premier magazine on practical, cost-effective technologies for an environmentally sustainable home and lifestyle. 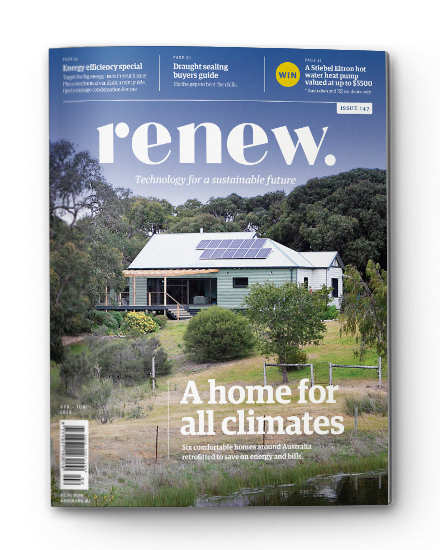 From energy-efficient cooling to off-grid homes, water efficiency, eco-camping and creating a non-toxic, healthy living environment in your home, Renew’s e-books provide rich and comprehensive information on a range of sustainable living topics. 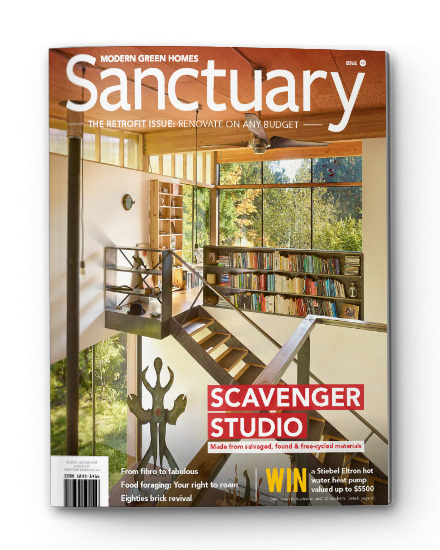 All contain a compilation of the best articles on a given subject from Renew and Sanctuary magazines as well as buyers guides and other bonus sections. Renew’s e-books can be downloaded as PDF files and are free for Renew members, $5 for non-members. The seventh edition of the ever-popular Solar Electricity booklet provides a thorough yet concise overview of what you need to know before choosing and installing a solar power system. In it you will find information about types of solar power systems, system components, sizing your system, installation, rebates and feed-in tariffs. Learn the difference between a grid-interactive system used in urban areas and stand-alone and hybrid systems if you live in a remote area. There are also checklists to help with selecting a solar system and installer. Member price $4.25 (non-members $5). The revised edition of our popular Efficient Hot Water booklet helps you plan your sustainable hot water system. With updated and expanded content, it looks at the latest in energy efficient hot water systems. In the booklet you will find all the information you need before installing solar hot water or heat pumps. Topics covered include: different types of systems; how systems work and their components; retrofits; size and site location; rebates, standards and greenhouse savings; and heat pumps and hot water. Member price $4.25 (non-members $5). If you’re a home owner or renter, you can make changes to your home to make it more comfortable, save money and reduce your environmental impact. Many actions can be done at zero or low cost, or through small changes in your behaviour. This booklet is designed to help you reduce your rental home’s energy and water use without the need for major renovations. The booklet covers topics such as draught proofing, shading, heating and cooling type, lighting, efficient hot water systems, energy efficient appliances, water use, solar for tenants, strata living and working with your landlord. The free guide was developed by Renew with support from the Lord Mayors Charitable Foundation. Renew’s Consumer Guide to Smart Meters helps households and small businesses understand and take advantage of products and services associated with smart meters. This easy-to-understand guide also looks at flexible pricing where consumers can choose to be charged more to use electricity at peak times and less during non-peak times.